The SuperSwitch is a DSC style switch designed for the demands of large scale aircraft. The standard switches with their 22 gauge wires are just not sufficient for 1/3 scale aircraft up. Even with dual receivers in the 40% and larger planes the current draw from the battery through the switch can be substantial during maneuvers. We have measured a digital servo, unloaded, drawing 0.6 Amp when kept in continuous motion. Image what the same servo is drawing under load and then multiply that by the six to eleven servos you have in the plane. While this may be momentary this is when you need the least voltage drop to the servo as voltage supplies the servos’ torque. Reduce the voltage the servo sees and you reduce the torque the servo can supply. The unique features of this switch is the 18 gauge wire on the battery side with high-quality XT-60 connectors and the dual leads on the receiver side. 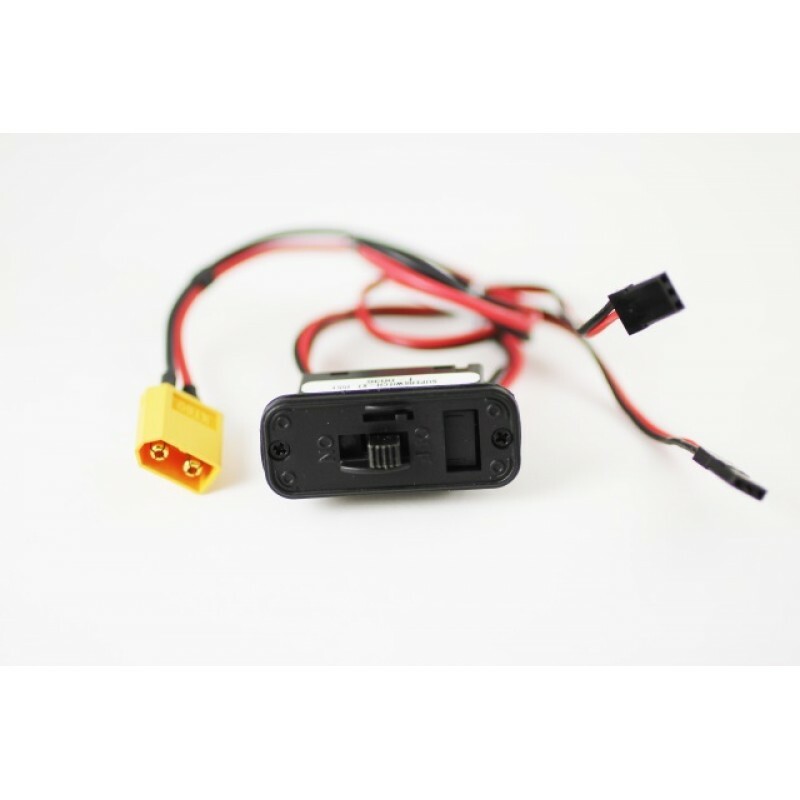 This wire and connector combination allows you to mount your battery anywhere you want and you don’t have to worry about voltage drops in long wire runs. This minimizes the voltage drop cause by wire resistance. At the high currents digital servos require from the battery this can actually be substantial. We have measured a half volt drop over eighteen inches of 22 gauge wire and one connector at 5.0 amps. On the receiver side, again one or both leads may be used but both leads is recommended so that your system see the full battery voltage. The leads provided will fit any radio system brand. The receiver leads are JR style which will fit both Futaba and JR receivers.